The kickoff to the 2012 football season is less than a week away and with it comes high expectations for the Bethune-Cookman Wildcats. The Cats ended last season on a 6 game win streak and was as hot as any FCS team in the country. 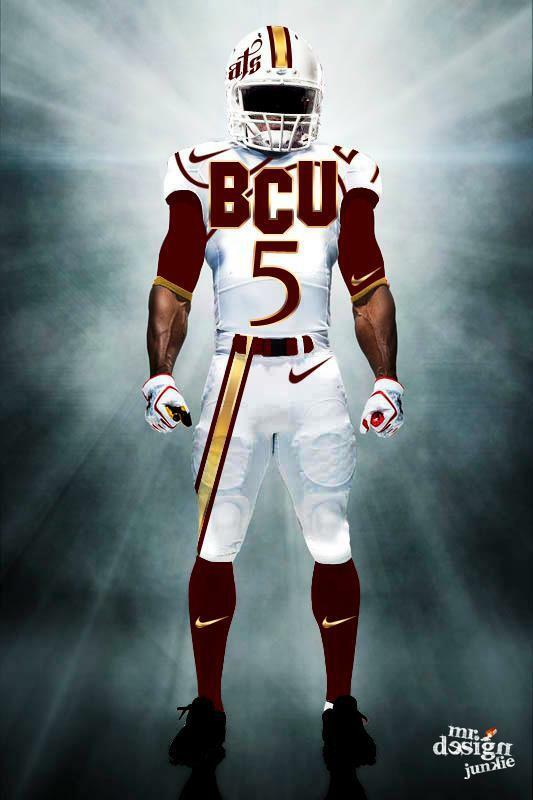 Even still, BCU was overlooked and failed to receive an at-large invite to participate in the FCS playoffs. This season Brian Jenkins’ squad looks to control its own destiny by winning the conference’s automatic playoff berth outright. The journey begins on Sunday, September 2nd at noon when the Wildcats faceoff against Alabama State in the MEAC/SWAC Challenge in Orlando. To help get you ready for the season, we previewed the BCU defense, offense, special teams and schedule. DEFENSIVE OUTLOOK—The Wildcats lose six regular starters and a ton of experience on the defensive side of the ball. Preseason All-MEAC selectees Harold Love III (defensive line), Jarkevis Fields (linebacker), and DJ Howard (secondary) will need to provide leadership and stability to the defensive unit while some of the newer starters round into form. Last season the Cats ranked 3rd in the conference in Scoring Defense (20.2 points per game) and 2nd in Red Zone Defensive Efficiency (yielding 22 scores on 32 chances). Linebackers–Middle linebacker Jarkevis Fields led the team in tackles (76 total tackles) and returns for his junior campaign. Fields will likely be flanked by true sophomore Tavarus Dantzler and redshirt senior Dawud Lane in the linebacker corp. What the two new projected starters lack in experience, they make up for in speed and athleticism. Nesly Marcellon and Markeil Floyd are also likely to see time in the regular LB rotation. Secondary–The defensive secondary is stocked with experienced players. DJ Howard, Tim Burke, Dion Hanks and CJ Wilson have all played a ton of snaps in their college careers. We expect Burke and Hanks to get the starting nods at cornerback and ultra-talented sophomore Nick Addison to join DJ Howard in the safety roles. Call it a hunch, but we would not be surprised if true Freshmen Terry Harden found his way on the field as a backup to either Addison or Howard at safety. Defensive Line–Tevin Toney and Anthony Woodard join Harold Love as highly productive returners along the defensive front from a year ago. Rakeem Knight and Jerome Culp also saw their share of action last season and look to factor into the defensive line rotation again this year. UCF transfers Brandon Bryant and LeBrandon Richardson are two of the newcomers that we expect to contribute to this unit right away. Defensive line coach Earl Lane joined Brian Jenkins’ staff last season. Under his watch, Ryan Davis progressed from a good football player to the best defensive player in the conference. Wildcat fans are hoping that this trend continues and that another diamond along the defensive front is unearth in 2012. OFFENSIVE OUTLOOK-Seven regular starters return to an offensive unit that led the conference in Scoring Offense (33.6 points per game), Total Offense (435.3 yards per game) and Rushing Offense (259.3 yards per game) a year ago. Jim Pry debuts as the third offensive coordinator for the Wildcats in as many years, but don’t expect big changes to the offense. The Wildcats are expected to run the same brand of high-octane offense we have witnessed over the past two seasons. Offensive Line–If the old football adage “it all starts up front” holds true, the BCU offense should be in great shape in 2012. The offensive line features 3 players that have won All-MEAC honors in their careers (Terrence Hackney, Marquell Rozier, and Alex Monroe). Blake Pritchard and R.C. Mullins are also experienced players along the offensive front and will look to compete for starting roles and/or provide solid depth in the trenches. Lavon McCoy is down to 380 pounds according to BCU’s online roster and will convert from defensive tackle to offensive guard this year. Based on our projections, BCU’s starting offensive line averages 6’5”, 325 pounds this season. Running Back–BCU’s potent rushing attack will be led by 5’10”, 195 pound junior running back Isidore Jackson. Jackson had a breakout season a year ago averaging 103.7 All-Purpose yards per game (86.6 rushing and 17.1 receiving) earning All-MEAC 1st team honors in the process. He racked up 206 yards rushing in an ESPN nationally televised contest against eventual conference champion Norfolk State last season. Jackson has an opportunity to amass over 1,000 yards rushing this season but states that it is more important to him that the running backs gain over 2,000 yards rushing as a unit. Old Miss transfer Rodney Scott is expected to play a significant role in the rushing attack this year as well. Andronicus Lovette will have a chance to play significant minutes at fullback, while speedsters David Allen, Angelo Cabrera, and Tyree Smallwood will vie to find playing time in the talent crowded backfield. Wide Receiver–Eddie Poole returns as the Cats top threat on the outside. The senior from Glades Central High caught 41 balls last season and added 4 receiving touchdowns. David Blackwell converts from quarterback to wide receiver this season and offers the Cats another dynamic playmaker at the receiver position. KJ Stroud, Patrick Harris, and Preston Cleckley all have big play potential and will look to contribute in the passing game. True Freshmen Ray Martin is an electric player who has a chance to contribute in the receiving and return game right away. Quarter Back–Jackie Wilson emerged from spring drills atop the depth chart at quarterback. Wilson completed over 66% of his pass attempts last year and was undefeated as a starter against FCS competition. The 6’0”, 215 pound junior from Ft Lauderdale is expected to be pushed for the starting nod by Louisiana Tech transfer, Brock Waters and 2010 Florida Mr. Football, Quentin Williams. Waters seems to be the best of the three with his legs, Williams with his arm, and Wilson the best dual threat. SPEACIAL TEAMS OUTLOOK—Sven Hurd and Kory Kowalski return as the placekicker and punter respectively. Last year, Hurd set a BCU single-game scoring record for kickers when he recorded 7 PATS and 3 field goals (16 total points) against Fort Valley State. For the season, Hurd went 46 for 47 on point after attempts but struggled with his field goal accuracy (7 for 13). Newcomer Austin Stewart adds depth to the Wildcat kicking unit and provides Coach Jenkins with an alternative at placekicker. The Wildcats will be looking to improve upon their pedestrian 7.3 yard punt return average and 20.9 yard kick return average from last season. Angelo Cabrera, Preston Cleckley, Courtney Keith, and Patrick Harris shared the bulk of the return duties last season. All four players return this year; however, they can expect to be pushed by newcomers Brock Waters and Ray Martin who could factor into the return game. Alabama State (MEAC/SWAC)—The Hornets are loaded with talent and have a ton of momentum in their program. ASU debuts a brand new stadium this year and have been rumored to be considering a move to the FBS level. Coach Reggie Barlow’s team features good balance on both sides of the ball and finished 2nd in the SWAC in both Scoring Offense (26.7 points per game) and Scoring Defense (17.5 points per game). University of Georgia Transfer Isaiah Crowell (RB) and Greg Jenkins (quarterback transfer from Troy) will present challenges for the Wildcat defense. South Carolina State (Away)— This early season matchup with the Bulldogs will likely have significant conference championship implications. The Bulldogs are led on defense by safety Darious Drummond. Offensively the Bulldogs return most of their starters from a year ago. Standout receiver Lennel Elmore returns after sitting out last season (academics). BCU defeated SCSU 14-0 in their last visit to Orangeburg but fell to the Bulldogs 18-26 at home in 2011. Miami (Away)—Al Golden is in rebuilding mode in Coral Gables. But let’s not kid ourselves; it is still “The U”. BCU gave the Hurricanes all that they could handle for 3 quarters last year. With a lucky bounce here or there and if one or two other things go our way this year who knows how this year’s contest will turn out. I would not bet Aunt Bessie’s social security check on it but it’s the preseason and we’re allowed to dream a little aren’t we? Tennessee State (Home)—Head Coach Rod Reed is quietly stock piling talent in Nashville. Reed, a one-time BCU assistant, seems to be capitalizing on his Florida connections as the Blue Tigers have seemed to established a recruiting pipeline in the Sunshine State. Tennessee State is one of the most storied HBCU football programs. This rare meeting between TSU and BCU should bring a lot of excitement to Municipal Stadium on September 22nd. Hampton (Away)—7-3-6, as in NCAA football Rule 7, Section 3, Article 6, subsections IX, XII, XIII. A.R. 7-3-6 is the Rule that was cited and allowed replay officials to overturn Hampton receiver Isiah Thomas’ apparent game-winning touchdown catch as time expired against the Wildcats in Daytona last season. BCU survived with a 35-31 victory over Hampton. Junior running back Antwon Chisholm leads a talent laden offensive unit while linebackers Lyndell Gibson and Delbert Tyler anchor the defensive units. The Pirates will be looking for revenge while BCU will be looking to extend their four game winning over HU. North Carolina A&T (Home)—Last year Brian Jenkins stated that North Carolina A&T lined up and whipped his team’s tail. The statistics agree. The Aggie defense held BCU to 5 yards rushing and 108 yards of total offense. OUCH! Offensively the Aggies boast the league’s leading rusher from last year in Mike Mayhew. Two years ago Mayhew ran for over 200 yards against The Wildcats in a one-sided contest that went in BCU’s favor (remember the blackout game). Norfolk State (Home)—The Spartans won their first ever MEAC title last season. NSU’s lone conference defeat was suffered at the hands of BCU. Head Coach Pete Adrian and his Spartans will be looking for their first ever conference win over BCU in Daytona Beach when they visit on October 20th. Jamal Giddens (LB) and Xavier Boyce (WR) lead the Spartans on the defensive and offensive sides of the ball. North Carolina Central (Home)—The Wildcats defeated NCCU in a tightly contested contest two seasons ago. Last year the game was more one-sided. The Eagles visit Daytona this year for the first time since rejoining the MEAC. NCCU may not have the same level of across the board talent as BCU, but you can be certain that a Henry Frazier led team will be well-prepared and well-coached. Morgan State (Away)—The Bears have a great nucleus of offensive skill players. Travis Davidson is one of the best 2 or 3 running backs in the conference; Seth Higgins is a play making quarterback; and Tyrone Hendrix is a productive wide receiver and return specialist. MSU’s struggles last year occurred in the trenches. If coach Donald Hill-Eley’s team can improve along the offensive and defensive lines, the Bears may be this year’s sleeper. Savannah State (Away)—Steve Davenport’s team is still a few years away from competing consistently with the MEAC’s elite but there is seemingly a renewed interest in Savannah State football. SSU is definitely a program on the rise. We look for great things to come from SSU; but not this year. The Tigers open the season against Oklahoma State and Florida State. I’m not sure how much they will have left in them after those two contests in back to back weeks. Good luck! FAMU (Florida Classic)—See you in November! DAYTONA BEACH, Fla. — B-CUAthletics.com will host its 2012 football opening kickoff event Sunday night with a presentation that should last as long as an actual opening kickoff. Users accessing the official B-CU athletics site Sunday night at 8 p.m. will have an opportunity to win tickets and hotel accommodations for the Wildcats’ Sept .22 Hall Of Fame game against Tennessee State in Daytona Beach. The first user to access the contest page and correctly answer a trivia question will win four tickets and an overnight stay at Homewood Suites. Three other users will win a set of two tickets. Visit B-CUAthletics for complete coverage of the Wildcats’ 2012 Season Opener against Alabama State in the MEAC/SWAC Challenge on Sunday, September 2. So here’s the skinny; Bethune-Cookman has a record setting athlete who can jump out the gym. At 5’6”, which is roughly 3 inches shorter than the diminutive three time NBA Dunk Champion Nate Robinson, this athlete can touch a basketball rim. That’s pretty impressive right? Would you be more impressed if you knew that this athlete was a she? Meet Krysta Gardner. Gardner is a 1st team All-MEAC volleyball performer who set a BCU single season record last season with 479 kills. The senior outside hitter from Ashburn, Virginia needs just 170 kills this season to top the 1,000 kill mark in her career; she needs 230 kills to become BCU’s all-time kills leader. But Gardner is not the only standout performer on BCU’s volleyball squad. Janeen Davis, who is also a senior and outside hitter, registered 450 kills last season and would currently hold the single season record if not for her teammate. Davis needs 325 kills this year to reach the 1,000 kills mark for her career. Gardner and Davis are the cornerstones of Coach Isaac Raphael’s rapidly improving volleyball program. They were the only teammates named to the MEAC’s All-Tournament squad last season. Despite their relative lack of height by volleyball standards, Gardner (5’6 ½) and Davis (5’8”) are unquestionably two of the better outside hitters in the conference. “We definitely have a disadvantage because of our height but we make up for it with our verticals (leap)” Janeen Davis said. Krysta Gardner went on to state: “I don’t really think about my height much because I jump relatively high. But like they always say, it’s not how tall you are, it’s how big you play”. …and play big they do. Coach Raphael went on to state: “not only are they great players, they are great individuals. They are very humble young ladies. I think they accept their roles as leaders (on this team) humbly and they are ready for the challenge of another great season”. Gardner, Davis and junior defensive specialist, Jennifer Jimenez make up the core group around which Coach Raphael could recruit and address the issues that separated his squad from the top teams in the conference last season. “We made a concerted effort to add more height. We have several players over 6 feet tall this year and we’re much further along fundamentally than we were at this point last season”. “Jennifer Jimenez (who set a school record with 395 digs last season) helps us. Without her passing, we wouldn’t be where we are”. “We needed better defense and better ability to block at the net which I think we have this year. The other thing we need to compete (with the top teams in this conference) is confidence. We’re starting to believe that we are a good program”. “We have athletes. They may need some more training, but they’re workhorses. With some tweaking here and there, we’ll be right there with the top teams in this conference”. Coach Raphael expects freshmen Delicia Pierre, Phylecia Armstrong, and Monica Lowe to step in and contribute right away. Gardner and Davis also welcome the new additions. “Last year, Jeanne and I hit most of the balls. With this new team we have a lot more options (offensively) so I’m looking forward to that” Krysta Gardner stated. Janeen Davis replied: “we have the players, we have the heart; I think we’re going to surprise some people this year. I expect to win the MEAC”. Wildcat fans can catch their first glimpse at the 2012 edition of the BCU volleyball team when they host their annual Maroon and Gold game this Sunday, August 19th at 1:00 in Moore Gymnasium. 1. He is an excellent football coach. 2. He is an extremely passionate individual. The third year head coach’s passion was on clear display at Sunday’s Media Day Event when discussing two specific topics: (a) his commitment to develop his players into responsible, productive men; and (b) how much he hates losing. The Wildcats are 18-5 under coach Jenkins’ leadership and they enter the season ranked as high as 14th nationally in one pre-season publication. However, Coach Jenkins repeatedly and emphatically stated that “our program is about more than winning football games”. “I love my guys and I will shout it from the mountain top”. “We have a program that’s dedicated to building men. It makes you feel good to know that your program is looked upon nationally for not just your football accomplishments, but for building young people also”. The Wildcat football program received the FCS ADA Academic Progress Rate (APR) Award for being the Most Improved Mid-Eastern Athletic Conference (MEAC) school after improving to an APR score of 935 during the 2010-11 school year. Several members of the squad have even already graduated and are enrolled in graduate school. Coach Jenkins’ fatherly influence extends far beyond the playing field and classrooms of his players; it also reaches into their family lives. “I’ve got a lot of young father’s on this team. We often counsel with them and tell them that there is no reason that you should not be there for your child. You don’t let a team meeting or anything else affect that. You got a lot of fathers that bring their kids to study hall and team meetings. We have some ladies that work in our front office who offer babysitting to our guys so they can study and stay on topic”. True freshmen Ray Martin of Sanford Seminole High School chose BCU over several BCS schools including Ole Miss and West Virginia. Martin cited the pro-family environment established by Coach Jenkins as one of the primary appeals in his decision to sign with BCU. “We try to provide a strong family for our team” Coach Jenkins stated. “Our wives are heavily involved and they try to teach some of our players parenting skills”. At least two of BCU’s football players are single fathers who have sole custody of their children. Coach Jenkins said “I am very proud of my guys for taking on their responsibility of being a (single) father in spite of playing a college sport and for maintaining a high level of both. So in my book I’m a grandfather and I couldn’t be more proud of them”. “I love this team and my players so much. They are not all angels. They make mistakes but they don’t make excuses. They give me all that I ask of them in every aspect”. Coach Jenkins’ affinity for his players extends to his former players as well. When asked about the team’s newest graduate assistant, (former BCU QB) Matt Johnson, Coach Jenkins liken him to “a friend that you bring home and feed once but then you can’t get rid of them”. 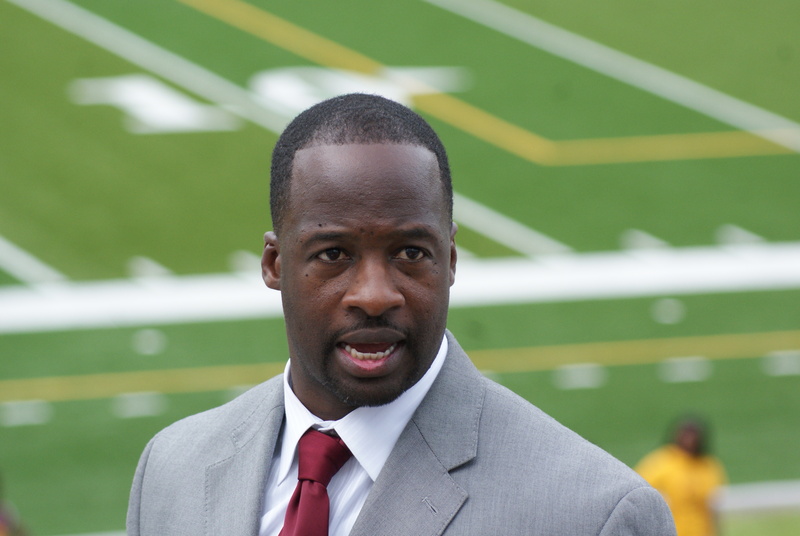 He went on to praise Matt Johnson’s accomplishments on and off the field namely being named as BCU’s first Jake Gaither award winner in 2010 for his on the field production as well as being recognized by the University as “Business Student of the Year” for his work in the classroom that same year. He went on to state that Matt Johnson has “walked in the direction that they are trying to get the (current) players to walk in. He is living what he has learned (as a BCU football player) and he’s done a tremendous job in life and with our quarterbacks”. The fatherly passion and care that was evident when speaking about his players quickly gave way to the intense and poignant side of BCU’s head ball coach when asked what would define a successful season for his squad. “Win a national championship!!! Anything less is unacceptable”. “Everybody is jumping around saying 8-3–you did good last year. To hell with that. Those 3 (losses) bother me a lot more than those 8 (wins). The numbers look good but a national championship would feel a whole lot better. I didn’t just take this job as a stepping stone or to build stats. We want to win a national championship and that’s what we work towards every day in every way! I let them (the players) know from day one. We want to win a national championship. It’s a dirty, grueling, ugly, hard process and you have to be willing to go through it. I tell my guys that if you’re not willing (to go through the process of becoming a national champion) then leave, go somewhere else. This might not be the place for you. There are no bones, no mistakes, no false statements about it; our goal is to win the national championship”. When asked if the Wildcats needed to upgrade their schedule to assist in reaching the goal of winning a national championship since the MEAC has gone so long without winning a playoff game the coach responded: “we do need to do a better job of winning in the playoffs but when you upgrade your schedule and then you have the record that you’re supposed to have, then they find a way to overlook you, is that the MEAC’s fault? Let’s call it what it is. People want to talk around it. There are some teams that have been placed in the playoffs whose schedule is not ‘King Kong’. Of course you want to schedule (FCS) playoff teams (during the regular season), but do they want to do that. (Sometimes we) make a phone call and they say that they will get back to you, but they never call you back. What do you do in those situations? I tell my guys to win them all and you won’t have to worry about it”. The Wildcats will get their chance to win the first one of the 2012 season when they face off against Alabama State in the MEAC/SWAC Challenge in Orlando on Sunday, September 2nd at 12:00. Rumor Mill–Tyrann Mathieu to Bethune-Cookman??? What if Bethune-Cookman landed the biggest HBCU/FCS recruit since Steve “Air” McNair walked off of the campus of Alcorn State? That would be quite a story and a bit surreal wouldn’t you agree? Now before you close your web browsers and dismiss this as just more internet hype (and it could very well be just that), consider that at least two Louisiana Television outlets believe that Bethune-Cookman could be the landing spot for 2011 Heisman Finalist and National Defensive Player of the Year, Tyrann Mathieu, affectionately known as ‘The Honey Badger’. Mathieu was dismissed from the LSU football team earlier this week by Coach Les Miles for violating team policies. Television affiliates WLOX and WAFB (both of Louisiana) are reporting that Mathieu is likely to transfer to an FCS school so he can play this season. Among the schools listed as likely landing spots is Bethune-Cookman where former LSU assistant coaches Earl Lane and DJ McCarthy are currently on staff. In addition to the natural connections with Lane and McCarthy, BCU also offers Mathieu an opportunity to play for an FCS school with a recent history of producing Pro Bowl caliber defensive backs (i.e. Nick Collins formerly of the Green Bay Packers and Rashen Mathis of the Jacksonville Jaguars). McNeese State, Nicholls State, Southeastern Louisiana, and Grambling State have also been mentioned as potential landing spots for the junior defensive back. I am not certain if The Honey Badger himself knows for sure where he’ll be playing football this season at this moment, but I do know that Wildcat fans will be glued to this story until he makes his intentions known. Baggs Back In NFL with Ravens – B-CUAthletics.com – The Official Web Site of Bethune-Cookman Athletics.